Was it Gilligan and Marianne? Or the Skipper and Ginger? Or, dare I guess, Mr. and Mrs. Howell?
" Beer " didn't work. Bill Falzone: The episode was from 1967, titled "Splashdown". 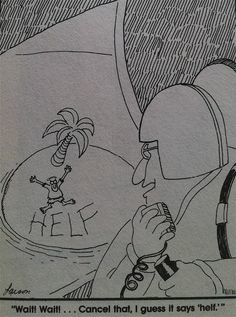 The castaways wrote "SOS" with chunks of wood, and set them on fire, so they cold be seen by an orbiting Russian spacecraft. Surprise! Gilligan tripped over the wood, rearranging it so that it spelled "Sol", the name of one of the astronauts. Geezer bus tickets to me, for remembering 1967.